1. Put the eggs in the Instant Pot. Add in enough water to cover the eggs and the soy sauce. 2. Add in the tea bags, the star anise, and the cinnamon sticks. 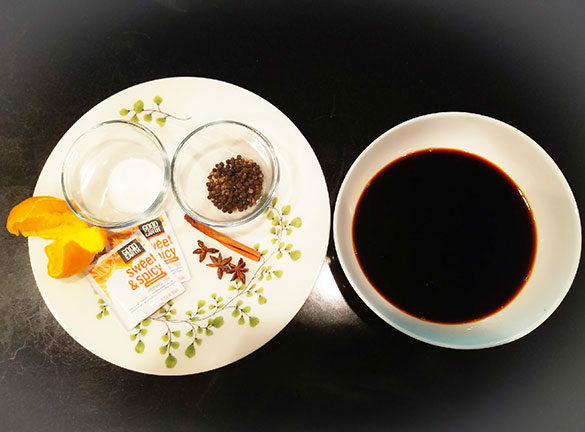 Stir in the sugar and make sure the soy sauce is mixed in as well. Put in the orange peel. 3. Make sure the vent is sealed and cook the eggs on Manual for 4 minutes. Do a quick release to release the steam. 4. Be careful as the eggs will be hot. 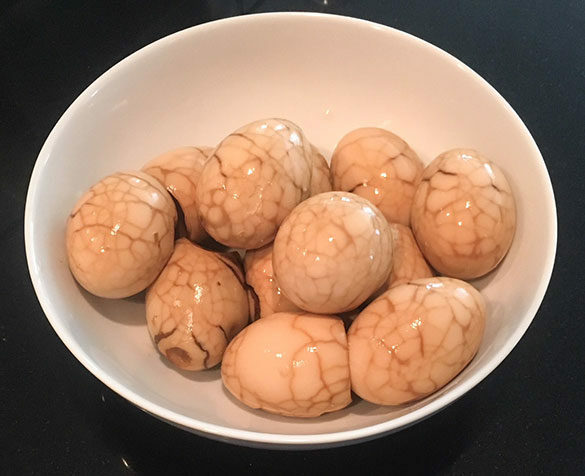 Crack each egg all over with a teaspoon but leave the shells on. This will create the marbled effect later. 5. Put all the eggs back in the Instant Pot. Leave in the Instant Pot with the lid on a minimum of 18 hours or overnight. You can leave it longer for a saltier and stronger flavor. 6. 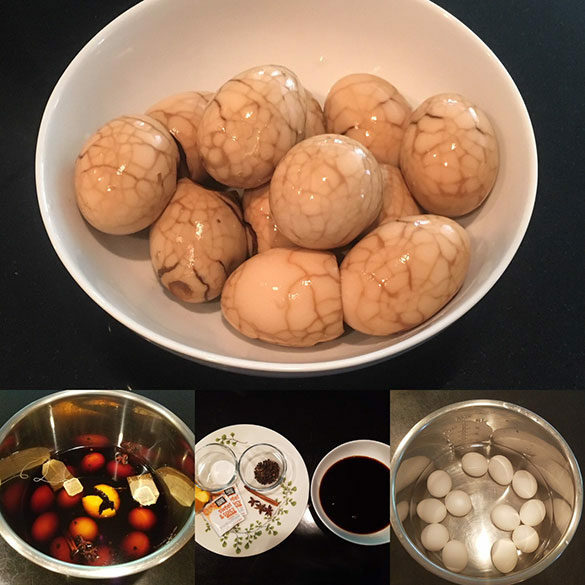 The next day or after 18 hours remove the eggs. 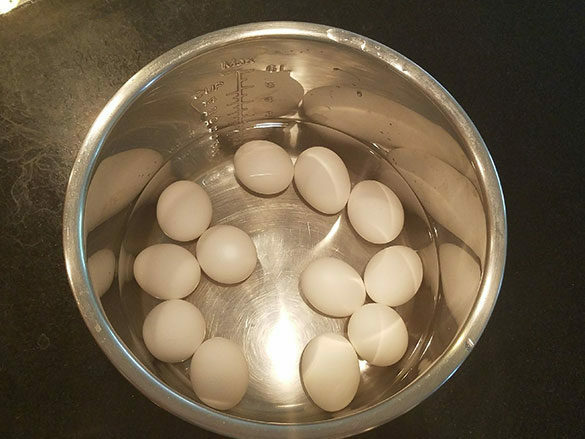 Run the eggs in cold water and take off the shells. You can eat them immediately or store in a container in the refrigerator up to a week. 7. Strain the liquid and keep it. This is called “lo sui” or old water. Store the liquid in a sealed container in the refrigerator. 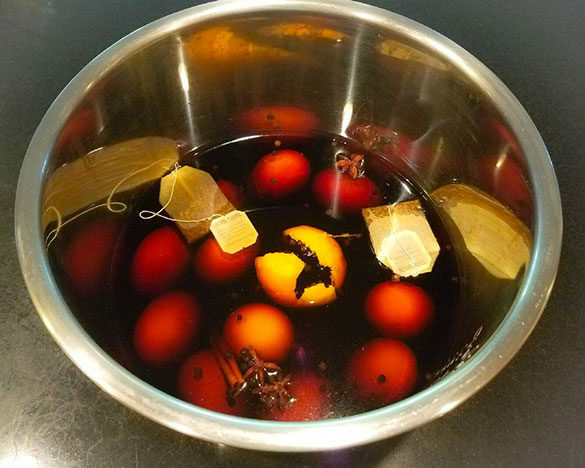 You can use this in the future to make more tea eggs or even to cook chicken, beef, or pork. If the liquid gets low, simply make another batch and add it to the old batch. Always strain the liquid after each use and store it in the refrigerator. *This recipe can be modified and made without an Instant Pot. Simply boil your eggs for 10 minutes, crack the shells all over with a teaspoon, return the eggs to the pot, cover and let it sit overnight.